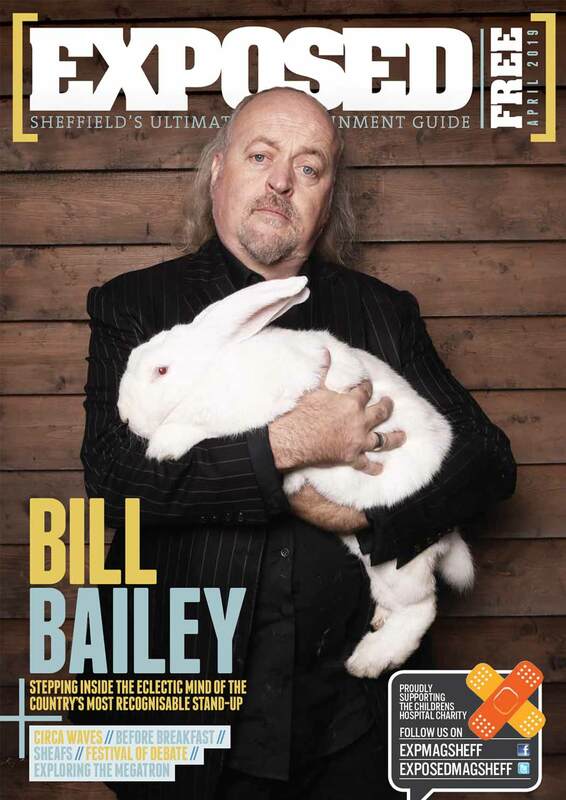 Exchange Street is set to become the place to be in Sheffield. With three new venues, a delicious Eritrean and Ethiopian restaurant and the exciting new Castlegate Escape street party on June 8th things are looking up for the former Castle Market, which became derelict in 2013. We spoke to the event’s manager and representative Steven MacKay to find out more about the fascinating melting pot of cultures in the area, and the aims of the street party to celebrate diversity through the arts. What’s the aim of the Castlegate Escape street party? A combination of things really – it came about as a part of an initiative to regenerate the area, the intention being to spark more activity there and give that part of Sheffield a bit of a boost. Aside from that, a big part of it for me is to involve some of the local surrounding communities and cultures and introduce them to what the Exchange Street Collective are up to. The Wicker, Burngreave and Park Hill areas are incredibly multicultural and have high immigrant populations including some really diverse communities like the Roma, Eritreans, Ethiopians, Caribbean, Kurdish and Pakistanis. Ignoring these communities in the redevelopment would be detrimental to the area’s cohesion so we’re doing our best to get them involved. Why did you choose the name Castlegate Escape? It was actually Bally (of Bal Fashions) idea, his idea is to create an escape from the West Street and Fargate area to discover the gems in the less commercial area of Castlegate and Exchange street. So are you aiming to get the white middle-class people down as well? Yes, but both ideally. It would be great to encourage multiculturalism and create some positivity that goes beyond just supporting communities in the area. We’d like to make the lines less blurred between the prevailing cultures in Sheffield and get everyone together. Can you tell us a bit more about what’s going on with Exchange Street at the moment? Sure. 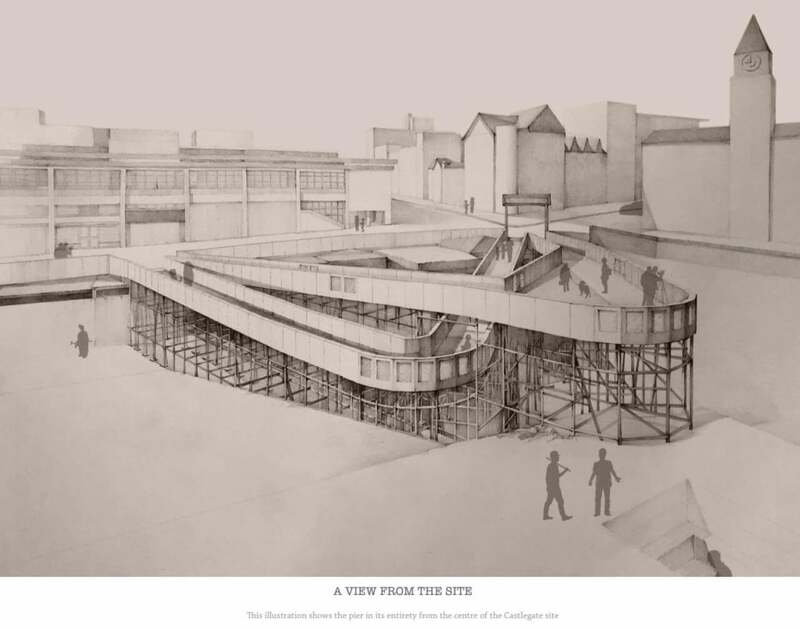 There’s some funding to excavate the former site of Sheffield Castle, which is where Castle Market was built, and is also where Mary Queen of Scots was held for 14 years in the 16th century. A proposal has been accepted to build a pier onto the excavation site there so you’ll be able to see the archaeological dig going on beneath you. Sheffield City Council are also working alongside CADS and the resident creative venues (Plot 22, BAL Fashions and Delicious Clam) to help regenerate the area socially & culturally. The Collective have had some difficulties with noise complaints from a resident in the Quays, and these resulted in all the licenses being blocked for a short time but we’ve managed to find a solution together with the Environmental Protection Department. We’re just going to be even more diligent with the sound issues, by putting in more sound proofing and continuing to monitor sound levels in the area. And how does the street party fit into this regeneration? Through redeveloping the area and multi-cultural events like this one, hopefully Castlegate will be the next area of Sheffield to create jobs and promote positivity between communities. What’s happened on the Moor and in Kelham Island has been really great, and we’re hoping that the same thing will happen on Exchange Street, but in a more creative nature. We’re primarily programming acts from the local cultures. We’ve spent a lot of time speaking to SADACCA, the Afro-Carribean community centre on the Wicker. There’s also Tony Bowring (of Koni music & Rafiki Jazz), who does a great job providing a link between promoters and immigrant musicians in Sheffield – he linked us up with one of our most exciting acts, Marek Pacan. He’s a Roma singer who was on Slovakia’s Got Talent, and his YouTube video racked up 3.5 million views! Have you got the new Lord Mayor Magid Magid involved in all this? I can imagine him being all over it! We’ve tried to get in touch with him but awaiting a reply! Four in the day time. There’s the talks and poetry stage at BAL Fashions, a DJ stage in Plot 22, a Small Ideas takeover at Delicious Clam and then the main stage on the street where there’s gonna be tons of world music alongside some Sheffield locals like Otis Mensah, Andy H, and a special guest appearance from a a very exciting Sheffield band who we’re not allowed to announce. What’s the plan for food and drink? Frehiwet Habeesha, a restaurant on Exchange Street are doing their famous Eritrean/Ethiopian cuisine. They’ve been here for longer than anyone else and the food is incredible. They’ve also been partial to having parties… So we’re hoping they’ll get their fans down. Then there’s Marcia’s from the Wicker, an amazing Caribbean place, Motore cafe are doing coffee and The Wing Kings, a fried chicken and soul food stall run by an ex-professional basketball player called Olu. Will the Castlegate Escape be returning? Yes, part of this year’s plan has started looking forward to next year. Thanks for the chat, Steven! See you on June 8th. 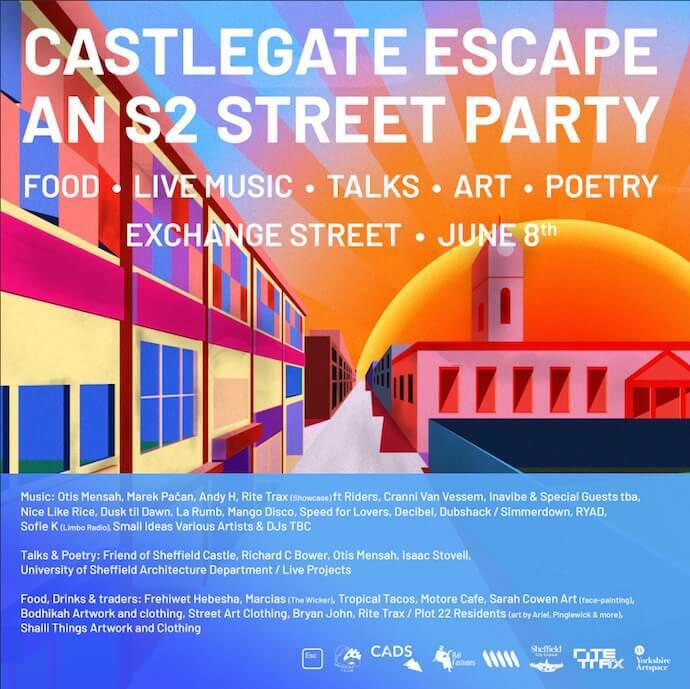 The Escape to Castlegate Street Party is on Friday June 8th from 4pm til 10pm and entry is free. Get down early to guarantee entry as there is a limited capacity across the 4 stages.